Rise up: I love me some Muay Thai! This makes me sad cause it confirms/reminds me how long it's been since I've really been training. Well that's been more than just 3 months, I feel like the last time I've trained normally was February!! Double booo... Work has gotten the best of me but hopefully it will be worth the sacrifice in the end. It better be! cause this is a HUGE sacrifice ugh! 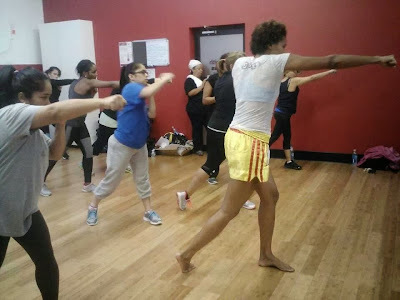 So my cousin, Jai Faith, has a fitness studio in the Bronx and asked me to teach a beginner's Muay Thai class on October 18th to raise money for the American Cancer Society. To which I quickly agreed to, how could I say no really lol. We had a great time, I grossed them out with my explanations of how the goal of throwing an elbow is to cut the skin between the eyes so that your opponent is blinded by blood and the fight gets stopped LOL! True story though haha Ohe! They had fun, they sweat and did really well with the technique. 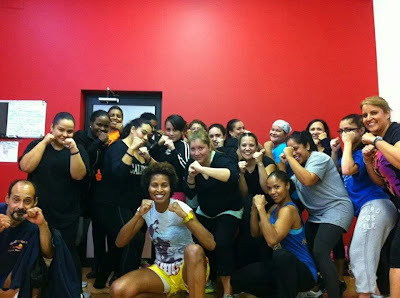 We had Beginner's Muay Thai at Jai Fitness Part 2 tonight. There were less people but I was able to show them more interesting combinations, like how to parry and catch a kick, and again they did great! Most of the successful MMA fighters spend a lot of money in their MMA gear as it brings them more confidence in their practice session and also in the main competition. Like Boxing in Connecticut.